Excel associates UserForm events not only with the form but also with each of the controls that exist on the form. You need to place event-handling procedures related to a UserForm in the code module for the UserForm object. The following table lists the available UserForm events. Excel adds a run-time control to the UserForm. The user performs a drag-and-drop operation. The user releases the mouse button to paste the data from the drag-and-drop operation. The user clicks the mouse on a UserForm object. See Chapter 14 for information on capturing the Click event. The user double-clicks the mouse on a UserForm object. The user deactivates the UserForm. Excel detects a UserForm control error. The user presses a key. The user presses an ANSI key. An ANSI key produces a visible character. The user releases a key. The user presses a mouse button. The user moves a mouse on the UserForm. Excel removes a control from the UserForm at run-time. The user repositions a Scroll box on a control. The user zooms the UserForm. Workbook" for more information on placing event-handling code in a class module. The following table provides a list of the application-level events that occur within Excel. An event that occurs for the application, in this case Excel. For example, Excel triggers the NewWorkbook event when it creates a new workbook. Occurs when Excel creates a new workbook. See the section "Run a Procedure when Excel Creates a Workbook"
Excel activates any sheet in any workbook. Event occurs before the user double-clicks any sheet with the mouse. Event occurs before the user clicks any sheet with the right mouse button. Cells on a worksheet change either due to a user or an external link. A user clicks a hyperlink on a sheet. Excel updates a sheet of a Pivot table report. The selection changes on any worksheet. Excel activates a worksheet window. Excel deactivates a worksheet window. 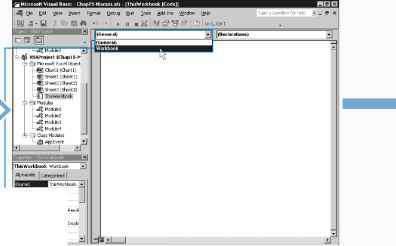 The user resizes a worksheet window. The user activates a workbook. An add-in installs a workbook. An add-in uninstalls a workbook. Excel prints an open workbook. Excel saves an open workbook. Excel adds a new sheet to an open workbook. Occurs after a Pivot table report closes the data source connection. Occurs after a Pivot table report opens the data source connection. You can create a procedure that runs automatically each time a particular workbook opens. Because this type of procedure only executes once as the workbook opens, it works well for launching custom menus and toolbars, opening other workbooks, determining if specific conditions are met, or displaying welcome messages. The procedure executes when the workbook opens by catching the Open event that the opening workbook triggers. To create a procedure that executes when a workbook opens, you create a new procedure and add it to the ThisWorkbook object code module for the particular workbook. In fact, all event-handling procedures that you create for monitoring workbook events must reside within the ThisWorkbook object to have Excel execute them automatically. To create a procedure that executes when a workbook opens, you name the procedure Workbook_Open. Although the procedure resides in the ThisWorkbook object code module, it can access other procedures within the same workbook. Therefore, you can create a Workbook_Open procedure that calls procedures located in other modules. If you have a procedure that you want to execute whenever Excel opens, you must place the procedure within the ThisWorkbook object for the Personal Macro Workbook, Personal.xls. Because the Personal Macro Workbook always loads as a hidden workbook in Excel, any procedures within this workbook appear to execute as Excel opens. Keep in mind, however, that Excel associates the Personal Macro Workbook with an individual user. Remember, you can keep a Workbook_Open procedure from executing for a particular workbook by holding down the Shift key as the workbook opens. Because workbooks typically open rather quickly, you need to make sure you press and hold the Shift key as soon as you select the workbook. '-n On the Projects window, locate the workbook where you want to add the Workbook Open subroutine. ^0 In the Object box, click Q and then click the Workbook option. You can use the Open method of the Workbooks collection object to specify a workbook that Excel should open whenever the current workbook opens. For example, if your workbook relies on data values within another workbook, you can open that workbook whenever the current workbook opens. See Chapter 9 for more information on using the Open method to specify the workbook to open. You can use the Object drop-down list on the Code window to quickly create your Workbook_Open subroutine. The Object drop-down list contains the available objects for which you can create subroutines within the current code module. For example, if you access the ThisWorkbook code module, the only available object is Workbook. When you select the Workbook object from the Objects dropdown list, the Visual Basic Editor automatically creates a private subroutine called Workbook_Open. This is because the default event for the Workbook object is the Open event. If you view the Procedure drop-down list, you see all the available events for the Workbook object. If you select another event from the list, the Visual Basic Editor creates a new subroutine for that event. I The Workbook_Open procedure executes the specified VBA code as the workbook opens. 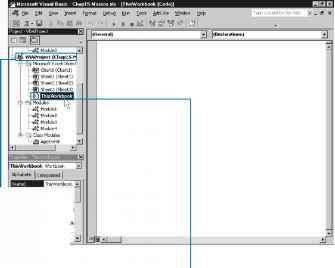 ■ The Visual Basic Editor creates a new Private subroutine named Workbook_Open. Type the VBA code to run when the workbook opens. E3 Click the Save button (pal) to save the workbook including the new subroutine.